I received a lot of positive feedback regarding our NBA TV 2012 Draft HQ special. Tune in to NBA TV’s summer league coverage to follow the early progress of the league’s promising rookie class. Perhaps it would make more sense for the NBA’s free-agency period to come before the draft. When you go after a free agent to fill a need for your team you know that player is a solid bet because you’ve seen him compete in the league for a number of years, as opposed to draft candidates who are still unproven at the NBA level. If the signing period for free agents came prior to the draft, you could pursue the pros you know will help your team and then fill out the rest of your roster at draft time accordingly. For example, if the Nets had already signed Deron Williams, would they have made a draft-night trade with Portland for Tyshawn Taylor? Brooklyn may still have selected the promising young PG to groom him for a bigger role down the road, but they might have played their cards differently if they had locked in their All-Star point guard before the draft. Baylor University sophomore Perry Jones III announced on April 9th that he would throw his hat in the NBA ring. Jones came out of high school as one of the top players in the country and had a solid couple seasons in Waco, helping the Bears to a 38-8 record in 2011-12. The 6’11”, 238-pound combo forward averaged 14 ppg and 7.6 rpg while shooting 50% from the field this past season. His top translatable pro strengths are his size and elite athleticism. At almost 7 feet tall, Jones can play down low or on the perimeter. He is also extremely fast and fluid going end-to-end, and his jumping ability is off the charts. The 20-year-old Duncanville, Texas native posted season highs of 31 points, 14 boards, 4 blocks and 4 steals. Jones moves well without the ball, makes sharp cuts and is skilled in the pick-and-roll. He uses both hands off the dribble and can get to the rim consistently with his arm length and quick, long first step. PJ3 has big, sticky hands and is able to catch tight passes in the post or in transition. Once he has the rock, he finishes well, especially when he faces up slower-footed big men. Jones possesses a promising jumper and should become a legitimate long-range threat with time and practice. Jones’ rebounding upside is enormous. As with many young, natural talents, Jones will be a glass-cleaning menace, both defensively and offensively, once he locks in mentally and decides to crash the boards. On the defensive end, Jones has all of the tools to one day match up with 2’s, 3’s and 4’s thanks to his wingspan, footwork and shot-blocking abilities. As with his rebounding, Jones’ overall defensive game will be determined as much by his mental toughness and dedication as his physicality. Though Jones displayed his potential for greatness at Baylor, he was inconsistent. The consensus seems to be that if Jones can add fire to his furnace, work on his body strength and build confidence, he’ll enjoy a long, productive NBA career. 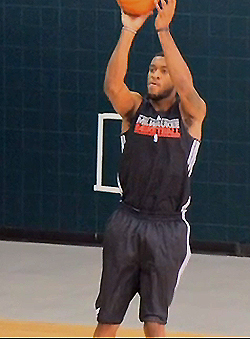 Look for Perry Jones III to go midway through the first round on June 28th.